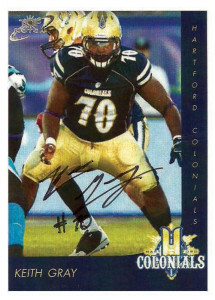 A physical offensive lineman who played collegiality at Connecticut from 2005-2008, Keith Gray was a free agent signee of the Carolina Panthers in 2009, and on the practice squad of the Indianapolis Colts in 2010. He joined the Florida Tuskers of the UFL in 2010, and was then traded to the Hartford Colonials (formerly the New York Sentinels) in exchange for defensive tackle Bryan Save in the league’s first ever trade that year. With the flexibility to play both guard and center, Gray was a valued contributor to the Colonials offense helping pave the way for the offense led by quarterback Josh McNown, and bruising runningbacks Lorenzo Booker and Andre Dixon. All in all Hartford rolled up 2593 yards in 2010, with 903 of it coming on the ground and an additional 1690 through the air, and a lot of credit up front with their prolific offense should go to the guys in the trenches, like Keith. Things were definitely moving in a positive direction for the team, but the organization as a whole- that being the UFL- was not. Bills had not been paid, and the rent was sky high at the Colonials facility. Head coach Chris Palmer, broke ranks with the league as soon as he could and landed a job back in the NFL as the offensive coordinator of the Tennessee Titans. In the meantime, Jerry Glanville was brought in to replace Palmer under much fanfare, but the Colonials, -under the most financial duress, -folded, and Keith was a free agent. Keith moved to Texas and focused on family life. In the meantime I had tracked him down through Facebook and offered him a card, but I honestly had a lot of things that went off the rails for me personally, along with a player who had agreed to respond to me after I sent him my customs, that never did. It made me really gun shy about the project. A few weeks ago though I finally buckled down and got back to the UFL and AFL cards that I had done, and with a few extra dollars in my pocket, went ahead and printed a few for my portfolio. I also remembered Keith and my promise and sent him some to keep. In a short 5 days he responded, writing me a touching note discussing about how he was a trading card collector as a kid, thanking me for the cards, how they are a great keepsake, and how they’ve sparked a fire in him to keep going. For all the Peyton Manning’s and Brett Favre’s I get TTM, it’s these types of responses in the end, that mean more than anything I could ever wish for.